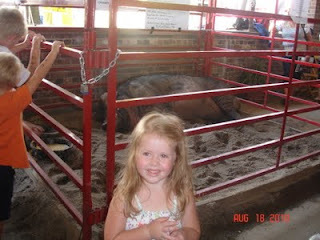 Kamryn and the prize winning hog. the grossly huge animals, and the people watching rivals any DMV. 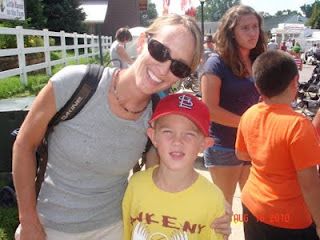 Unfortunately, the first fair I ever went to was The Iowa State Fair. This isn’t just any state fair. This fair is world renowned. Martha Stewart raves about it. Maura Tierney raved about it on the Martha Stewart Show. It’s listed as one of the 1000 Places To See Before You Die. So why, you ask, is it unfortunate that this was my first fair? Compare it to eating the best meal ever and then hoping that every subsequent meal stands up to that one particular dining experience. 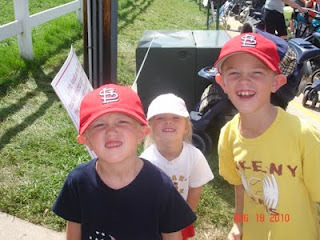 Last summer the kids and I made our annual pilgrimage to Des Moines, Iowa to spend the day at the fair with my best friend, Sara, and her kids, Ben, Thomas and Elise. First you have to understand that Sara and I have been friends for nearly 30 years and when we get together, there is a lot of talking, laughing, adventures and talking. Did I mention talking? Sara and I over the years. To be completely honest, I think Sara and I could put the “fun” in funeral if we were there together, so being at the fair with my BFF and her kids is almost excitement overload. What could be better than spending the day with friends at the happiest place in the Midwest? How about witnessing a birth? A new life emerging from…well, you know. A mother’s struggle, her reward for that struggle and we got to see it all! Cameras were rolling and broadcasting the whole event on screens for all to see! 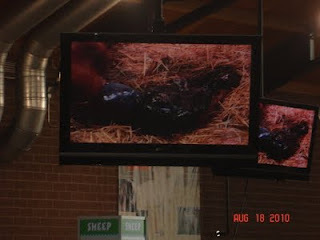 Baby calf still covered in afterbirth. Of course it was a cow – what kind of fair do you think this is? 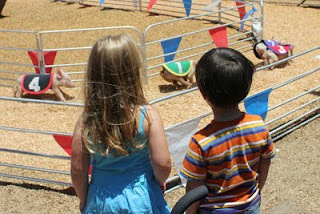 Yesterday, I took the kids to the San Diego County Fair. 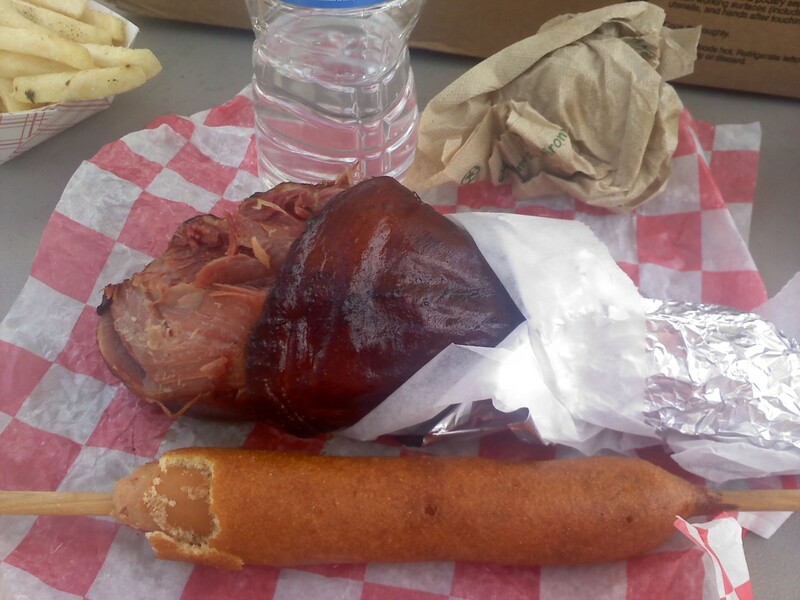 We no longer live in Iowa, so making it to the Iowa State Fair this year is going to be a little tough. 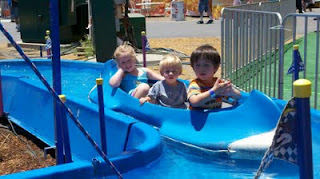 We met my friend, Janis and her kids, Jack and Violet for some fair-tastic fun. One of the first bonuses was I got to move to the front of the line to get in the entrance gate because I had a stroller! 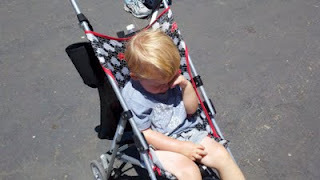 Rory pouting about not being 42″ tall in his “front of the line” stroller. Kamryn and Jack watching the pigs. rode rides, and enjoyed the absolutely perfect weather. Afterall, you can’t get a view of the ocean at the top of the Ferris Wheel in Iowa. I don’t think I’ll ever find a better fair than the one in Iowa, but I’m damn sure going to try to find the second best! 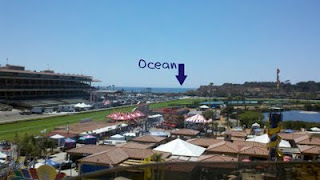 This entry was posted in food and tagged Iowa State Fair, San Diego County Fair by Amy. Bookmark the permalink. Well, even though I'm no Sara and San Diego is no Iowa, we had a blast with you. Next time, we need to hit the beer garden. Or sneak in a flask. 🙂 And put Rory in cowboy boots and a mohawk. I used to dread that damn fair. I hated that traffic, it made my life hell!